You are here: Home Is Financial Independence Retire Early (FIRE) right for you? I read a boatload of personal finance and investing articles within any given month. One thing that continues to get my attention is this FIRE movement – the desire of various blog authors to be financially independent and therefore retire early. This movement has me reflecting on our own financial journey of late. Is FIRE something we’re genuinely interested in pursuing? If so, how serious are we? What would it mean for us – financially – to get there? What changes or sacrifices would occur? What “freedoms” might we enjoy? What drawbacks or other considerations have we not thought about? What would it mean for us – financially? Mr. Money Mustache (the-retire-early-through-badassity-guy) claims he and his family of three live off about $25,000 USD per year. That’s give or take around $32,000 per year here in Canada. That seems pretty frugal. I recall his blog makes close to 20 times this amount now – in a year. So, I guess what he used to live on in his frugal days has little relevance now. He could certainly spend much, much, more if he wanted to – but does not. My point is, most FIRE folks like MMM live rather frugally in their 20s, 30s or 40s to realize their financial independence goals. Based on my knowledge, unless you are a successful entrepreneur or have a very high income it’s not realistic to “retire” in your 30s or 40s without a very high savings rate. MMM happens to have accomplished both. At age 50, I’m forecasting our monthly operating expenses will be about $4,000 give or take per month – a solid $1,300 per month more than the uber-frugal MMM even when you factor in our Canada-U.S. exchange rate. These expenses include mind you about $400 worth on contingency money. In any event it is our expectation that the income generated from our capital will cover basic living expenses. To realize FIRE sooner, some major changes or sacrifices would need to occur. The sum of these monthly operating expenses (excluding mortgage payments or prepayments) give or take is about $1,600 per month. Add up mortgage payments (and prepayments) and that’s thousands per month devoted to just shelter. Just looking at that, you may assume a) we’re nuts to own a home and b) renting in Ottawa would have been a far better choice. Maybe to a point but home ownership is more than a financial decision. It’s very much a lifestyle choice. Let’s not forget we have some home equity to be thankful for. The smaller houses in our area now sell for >$500k. I have no idea what they may sell for in the future but I’d like to think our home will slowly appreciate in value. The sacrifice for FIRE would be selling our home – soon or in the near future. By selling our house, the equity in our home could be put to work. The capital invested from selling our home could deliver some healthy investment income, likely close to $2,000 per month. That income could be used to rent in Ottawa. The alternative to renting would be to downsize our home rather significantly, moving within Ottawa or move to another city and buy a less expense home there. That would also have drawbacks. Moving away from family would certainly be one of them. We’re ready to sell our home yet. It doesn’t feel right – right now. Time to volunteer our time to causes and services in need. I suspect the luxury of time can be a blessing or a curse to some people. It would be a blessing if you have many aspirations of doing more with your life, while you still can, since time is everyone’s biggest constraint. It would be a curse if you’re stuck in a rut or have little clue how, where, and with whom you want to spend your time. What other considerations have we not thought about? Maybe one drawback of FIRE is a social one. While you’re busy living within your frugal means, the relationships you have with others may change over time. After all, most people are working when you’re not. This is not suggesting you can’t maintain the friendships you have but I’m thinking your social circle would evolve – potentially for the better but maybe for the worse. I suppose another drawback is stimulation. Work can provide lots of that for many of us. If there is no long-term career to be had I could foresee some people struggling with that. It’s good to be challenged in life. It’s motivating; it can give us inspiration. In my early 40s now, I value and appreciate time more. FIRE is something I’ll continue to read up on and give some consideration to but my wife and I are not ready to make any radical changes. More time and freedom would be great but instead of rushing towards this we’re more or less inching our way in this direction – enjoying the journey. If and when those changes come though, I’ll let you know. What’s your take on FIRE? Is this something you’ve read about, something you’re striving for or something you’ve already achieved? For those that don’t care about any sort of early retirement I’d like to hear from you too. Here is an investor who is on the sure-FIRE way to financial independence. 35 Responses to "Is Financial Independence Retire Early (FIRE) right for you?" Smart and thoughtful look at this extreme view on frugality and savings, Mark. I like Fred Vettese’s take on smoothing consumption over your lifetime so that you’re never depriving yourself or living in excess. Your balanced approach is certainly one to aspire to. Thanks Robb. You’re doing a killer job with your site and part-time financial career. Your balanced approach doing all this with a young family is pretty inspirational. Ha, no fast car here yet. Thanks for checking in Phil. A lot of good questions: Is FIRE for you? Then again, being part of the community, understanding the principles of the journey has thought us so sos so much on what we value in life, on what is important to us, that we are more free now than before. We live intentional now, we have fun money and holidays we like, We are grateful. One day, we even might decide to go on a big trip, blowing our budget and our FIRE plan, all for the experience. the way we see it now, FIRE is only one of the pillars that supports the one true goal: life a happy and meaningful life. 53 is an excellent goal, I suspect much sooner than most. I also appreciate the principles and I think I’ve learned to tailor my own/our own plan from it. We certainly have a good portion of fun and travel money but we’re also frugal in other ways. It will be interesting to see how we feel as the years go by. The beauty of the blog is you can chronicle it 🙂 Thanks for your comment and good luck on your journey. Insightful attitude, Amber tree. I’ll have to swing by your site and check it out. If I do this right and can retire from the US Army at 48 which is 11 years away I will walk away with a 4400$ @ month pension, and free Healthcare for my wife and kids. Add that to our 35k that we invest yearly I think I will be fire. Based on that we should make around 8000 a month in retirement. That is close to what I’m making now and would give me a good life. I will probably still work so I can pay for my kids college and put some decent money in their taxable investment accounts. Then I’m done working for someone else. At work I enjoy the relationships, challanges, and team work. I think I would miss that, and need it some whereelse. We always talk about buy 5 acres in someplace warm, building a house designing and digg out own pond, fishing a lot and raising military working dogs. I can’t and won’t live like a hermit eating oatmeal, rahman noodles, and riding my bike everywhere. It’s all about having the luxury today no, and be able to quit if needed. Thanks for reading and the comment Nicky. No doubt your role in the US Army is stressful – that is a healthy pension for sure. Given the changes going on with Trump I can only assume your healthcare is a great gift to go along with the pension you’ve worked for. It also seems you’ve invested well on your own. Kudos to you! As I’ve mentioned on my blog quite a few times lately… it’s finding the right balance between enjoying your life now and saving for the future. What’s right for you might not be right for me and vice versa. Living on either extremes do not make any sense to me. Having more time and freedom is nice but at what expense? If we sell our house today and move to move to a cheaper city or country, we are most likely already achieved FI. But we like our current lifestyle and where we live, so we’re prolonging our FI journey by a few more years to enjoy something we like, rather than doing more sacrifices. “Living on either extremes do not make any sense to me.” Totally agree. It’s not me, it’s not us. You seem to have a very good focus on things in your life. Thanks for sharing Bob. Thanks Marko! I recall you’ve worked hard to save and invest and create a solid retirement for yourself. Mark, this is a thoughtful piece. You’ve given careful consideration to your situation and lots of the other options/considerations. People should do the same to determine what is right for them. MMM is a very unique person, and IMHO is a rather extreme example of lifestyle/skills etc that probably isn’t going to work for many. We chose a balanced approach like you’re doing and have no regrets whatsoever. We worked hard for approx 30-33 years and had many great achievements and memories, a very nice lifestyle. My wife fully retired at 52, I was semi retired at 52 and full retirement on 55th birthday. In retrospect 3 years later that has been a perfect balance for us, allowing a good lifestyle during working years, freedom to choose our future and withstand a career/financial shock, still comfortable in retirement and young enough to do pretty much anything we want for years to come. It would have likely been possible to stop working 10-15 years earlier than we did (wife age 52, me semi @52, fully on 55th birthday) had we employed a FIRE mentality at an early age, with lesser house, no toys, fewer experiences, higher savings rate, and a lesser retirement. It’s too extreme for us in these regards, to mention a few. Even at our age now there isn’t many friends and family around to share increased free time with (most still work F/T), so that might be a consideration for some craving FIRE. You’re smart to focus on health as that’s a part that impacts even the best of financial plans/execution. We eat very healthy, exercise vigorously for 90-105 minutes 5 days per week, plus other activity. It gives me energy and a positive mindset. There is little I can’t do physically that even fit people decades younger can, and I hope to hold this edge for as long as I can. We’ll see. Good luck to you and everyone else in their journey. Thanks Rbull. Agreed…MMM is a unique breed! You were smart to have the FIRE mentality early. It has therefore allowed you many freedoms now….this is a common denominator amongst all early retirees I find: they want it and they work hard in achieving it. Thanks. We were focused and committed to our goals but not extreme in any way about life. Even though we had some setbacks and adjusted our target date we were still lucky in many ways and are thankful to be where we are. Reading your blog makes me realize there are many others including you sharing a similar path and doing a great job of achieving whatever they aim for. Thanks again…and yes…this is exactly how I approach things for the most part – having a plan and working hard to realize it. That goes for other things in my life as well 🙂 Best wishes RBull. Kudos to you for taking the time to think FIRE through on a personal and financial level now in your early 40s as most don’t think about the relationship and time side until they retire and then they get hit hard with reality. As many above have said balance is more likely the best method and you are living that. 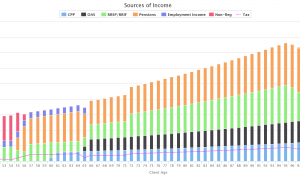 Given that the average age of retirement in Canada is 62/63, you are still technically in track for FIRE with your ability to retire at 53 and that age is a good one to strive for. I was FI at 51 while my wife still chose to work, I retired for a while. I decided after some time doing renos and whatever I wanted as well as starting up my own photography side job, that I still wanted more. Most of my friends and peers were still working as well. So I went back into the workforce on my terms and in a non stressful non management capacity…a big change from before. I love it and I will eventually fully retire when my wife does (she is 7 years younger), and still before I turn 60. I made a choice in my early 40s to ensure my kids had enough set aside to get their masters as well as to take trips and experience more of the world while young, or I could have retired long ago. This is the balance I chose on my terms and I would not go back and change it(wish I would have known what I know now in my 30s as I lost a lot in advisor mutual funds, moving me in and out for their own gain). I finally went self directed in my 40s and I am so much better off for having made that choice. As for budgeting and money you are wise to include for contingencies and luckily we now have TFSAs that we can invest in dividend paying stocks but also collect tax free from and dip into if needed without a tax penalty. Monthly expenses in our modest lifestyle hover around 4K per month and that is taken care of with a sub 750k portfolio of mixed stocks delivering an average of 4.187% as well as another mixed portfolio. My wife will also have a smaller (sub 1 k per month) defined pension when she retires early and it will just add to our income stream as will government benefits. At that time we will likely have grandkids and will use some of those funds for family trips and vacations and RESPs. Each person has different wants and needs and retirement goals and differing income and so will have to decide what balance is right for them. I chose my balance and then went back to work after a while for my own reasons, some will also do that. Enjoy the ride, have lots of experiences and make memories along the way. You only get one kick at this can, make sure you give it your best shot! Love your blog by the way, wish I have a knack for writing as I have lots of things to contribute to those starting the FI journey. You are touching on a lot of it already, so I will write vicariously through you lol. Cheers from the Kawarthas in South Central Ontario. I’m honestly trying to wrap my head around the whole FIRE thing. It’s something I believe we can achieve but I’m not about to burn myself out towards it. We’re in a decent place financially and we are very thankful for that. If the average age of retirement in Canada is 62/63 then we are ahead of that. Back to you, age 51 is amazing and very well done. I would love to work on my own terms and this blog is part of that passion and hobby. Again, great work on helping your kids. They are very fortunate. I have great parents that helped me out through university as well. They realized largely being debt-free by my mid-20s would be a key ingredient to my financial success. 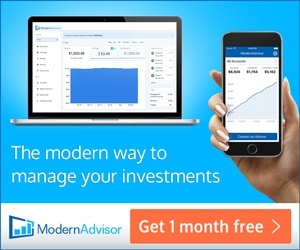 Your current monthly expenses are inline with our forecast – about $4,000 per month. It’s not living large but rather comfortable and the right lifestyle for us. If you have a sub $750k account to fund that lifestyle then this is assurance my wife and I should be fine if we meet our goal in the coming years of $1 M and a paid-off home. We’ll have small pensions coming our way but not until we are age 55 or likely age 60. If my wife and I can both earn, eventually, $2k per month each in retirement via pensions we’ll be very fortunate and grateful. At the end of the day it is about enjoying the ride and so far, so good. Great to hear you’re a fan from the Kawarthas. Been there, a lovely spot! Everyones situation is different and for many FIRE isn’t even in their radar. Is that bad? Depends on whether they are living within their means, or not. If they are than they probably are enjoying life and feel the future is something they will address later. If not, than life down the road will become much more difficult, or maybe they think their family or the government will provide them with what they need (good luck). The other point is what’s the big deal about FIRE. Life expectancy is becoming longer and retiring early may mean “Needed” much more income than working a shorter period can provide. Why not consider making ones working life better and more enjoyable before tackling the retirement issue. If you don’t like your job or career, do something about it, rather than complaining or dreaming about retirement. Retirement is a totally different life style and most people don’t consider the change or are prepared for it (Marks has some posts on this). I FIRE is something one desires than as mentioned develop a plan and work to achieve it. Not bad at all actually but I’ve learned few people have the combination of 1) great income, 2) great saving habits and 3) great mindset to retire early. There is really no big deal about FIRE other than I believe having “enough” (whatever that means to you) is a very strong, self-empowered tactic to ensure you are fulfilling your goals and dreams and ambitions in life – as soon as you can. You never know when you might be taken from this earth. Having the opportunity to share what you want with those you love as long as possible is a great gift. FIRE can afford you such an opportunity if that is something dear to you. Some level of FIRE is meaningful to me/us so we are working our way towards that in a balanced way I believe. Everyone’s journey is very different and mine wouldn’t appeal to some or maybe it would – I don’t know – but what it means to us is the most important thing. I’m 57 at the happiest and most fulfilled point in my life. I have a small technology business I work at part-time to bring in some income and keep my skills current. On most days I backcountry ski, snowshoe or hike in the forests out my back door with my dogs for hours on end with my camera taking photos – no hurry or time pressures anymore. I planned and worked hard to live my life as I choose. I have always lived below my means and realized that spending money on experiences makes me happy – not stuff. I have $920K in ETF’s. My financial security brings me options as to what I want to do…or not. For me that brings peace and joy to my daily life. “I have a small technology business I work at part-time to bring in some income and keep my skills current.” Wow, that’s great. Then you’re skiing, hiking, etc. Exactly how I intend to spend my time in the coming years. I just got back from The Masters in Augusta. Amazing experience. Because I have saved and invested, I was able to take time off work, spend some money for this trip freely and enjoy this “bucket list” experience I won’t forget. Our finances, slowly growing to $1 M will bring us financial security and options like you. That brings happiness for me/us. No doubt having about $1 M in the bank via ETFs churning out distributions and capital gains for you – you are set for life. Very well done. “For those that don’t care about any sort of early retirement I’d like to hear from you too.” — you asked for it! Not a chance in H-E-Double Hockey Sticks. “This money gives you power…” — a very obvious yet very wrong misconception and belief, but wholly understandable within a hyper-Capitalist environment. This might be the depressing part, that people think they only have power when they have money. Besides that, it’s most likely not ‘power’ one is seeking, but fulfillment, happiness, or purpose, of which money will deliver very little. We only have to have a cursory glance at any number of ‘Happiness Index’ reports: countries such as Singapore, Netherlands, and Bhutan are all on par, yet people in Singapore earn almost 20 times as those in Bhutan, and those in the Netherlands pay 3 times as much in tax as in the other two countries. How can people who make a lot of money, make very little money, or pay a lot of money all have relatively the same degree of life satisfaction? The answer isn’t tied to money. Power is not in the piggybank. “…relate FI to the concept of “F—K you, money” ” — this is perhaps the desperate bit. Think of your fresh faced twentysomething self…I’ll bet you definitely did not harbour a “F–K you” attitude, but one of optimism and creativity (possibly even of service). Ask yourself where/when/how your mindset became fractured, souring from engaged to disengaged. Studies have shown almost 80% of high performance employees value trade mastery over money. If money is your overarching focus and goal, you are probably underutilizing yourself and thus slowly drifting towards that “F–K you” mindset. Kind of like a dog that chews on your shoes because you don’t walk it or play with it enough. A Capitalist society may give small rewards (e.g. FIRE) to hard work and sacrifice, but the world rewards different thinking in monstrously greater magnitudes. There were lots of other investors last century, yet thinking differently delivered Buffett to the top. There were tons of other computer nerds out there, but thinking differently allowed the rise of Gates and Jobs. All the billionaires in the world are still fully active (e.g. NOT passive) in their businesses. It’s full engagement, not disengagement which brings freedom. You don’t need more money/time/options to do any of these things. As a true life anecdote, I have many relatives who did (and still do) everything on your list all while hands-on owning and operating businesses full-time for 35+ years. 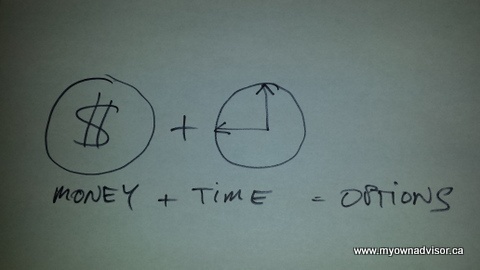 As for the equation: MONEY + TIME = OPTIONS… it’s wrong(ish). All the inputs exist independently of each other, and it does not compute very shortly after basic needs are met. Your “Options” result is superficial; what you truly desire is what that option represents. “One thing that continues to get my attention is this FIRE movement – the desire of various blog authors to be financially independent and therefore retire early. I think I’ve noticed this movement online now more than ever.” — as I wrote elsewhere, this is the result of a small number of events to which people seem to have a hard time responding. It has also coincided with the rise of financial and happiness inequality, and increase of general anxiety (and perhaps the decline in general resilience). Any wonder people are wanting to switch off and drop out? However, running away is a safety mechanism which is no longer useful…unless you are still being chased by lions and tigers and bears…oh my! I’ll close with a couple of examples…the first being Happiest Man In The World, Matthieu Ricard, a near-70 year old molecular biologist turned Buddhist monk. He’s practiced meditation for more than 10,000 hours (cue Malcolm Gladwell; not to mention the monks who have 60,000 hours under their belts…robes? ), owns nothing and earns no money…yet works tirelessly almost every day of the year. The second is Viktor Frankl, author of ‘Man’s Search for Meaning’ — a recollection of his time spent in a WWII concentration camp. While the monk Matthieu willingly chose to have nothing and fill his time with health and life, Viktor had everything forcibly removed from him and placed in an environment of unimaginable suffering and death. Yet, he managed to not only survive but thrive (and even create). One life of joyful abundance, one life of unrelenting hardship, same result. Give that a thought next time you complain about your job being a “prison” (a la MMM); you are probably saying ‘F–K you’ to the wrong person. FIRE is the result of acute ego damage and continuous ill-managed emotions; it has no place in my life. 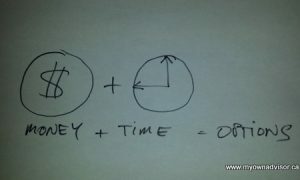 The paradox is, fixing a mindset is far more valuable than filling a bank account, but money is much easier than mind. And people will almost always choose the easy option. It’s +12 here and green…I’m going outside. LOL when I read this on vacation this past week. Nothing is guaranteed as you say – and even then – I want to work for the rest of my life…that includes some form of productivity and service. Regarding the “F–K You” money I 1) would never say that to my employer and 2) I don’t believe in it per se. It was a quote from the book. I do however SST believe in this principle = having enough income to meet one’s basic needs. We are striving for this and getting there slowly. I believe and I know it will…provide my wife and I with options. You are correct, my list of what I could do with my time doesn’t need to wait until FI but certainly there is only so much time in the day for things. Therefore having more control and more options regarding where, with whom and how we spend it is almost invaluable and cannot be quantified. You can’t ignore the fact that you can’t do everything you want all at once. It must be measured and you must prioritize your life (every day). Money is not my overarching focus. Never has been. 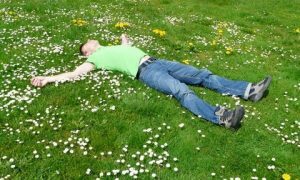 However having “enough” is what we are striving for sooner than later since my productivity to society can and should extend far beyond my day-time job or this blog. Time will provide that opportunity. I look at your housing costs and wonder why people think once they pay off their mortgage they are free. All in for my place my rent is $1000,for a two bedroom suite with my own backyard which also includes cable wifi, heat light, laundry, the only bills I have outside of rent(my half $500)is food of around $250mth, phone $100 mth, gas and vehicle costs of $150 mth and entertainment of $250 mth. All of my living expenses are less than what people pay to own a home after their mortgage is paid off, and I am looked down on as an idiot for throwing my money away to pay my landlords mortgage. My choosing to rent has made my trip to FI way quicker than if I was an owner, yet home ownership is espoused as one of the best financial decisions a person can make( but renting has allowed me to invest 60% of my take home pay to achieve FI before 50).After age 50 I can keep working for a couple of years and basically bank all my pay and in two years buy a nice house if I want without paying hundreds of thousands of dollars in carrying costs interest etc(these costs are never spoken about by homeowners), or I will be able to move to a lower cost area and enjoy my retirement if I so desire. People need to look at the big picture in life and calculate total costs over 20-40 years to get a real understanding of what it costs to live. Not me Mike. I think renting for you sounds very smart financially. Home ownership is not cheap by any means and you only come out “ahead” if your property value rises significantly over time. Otherwise, home ownership is far more of a lifestyle and emotional decision vs. a financial one. I thought the whole “F U Money” thing originated from the jlcollinsnh web site. There are a couple of good video clips where Collins plays the John Goodman part in a voice-over from a movie while providing investment and spending advice on how to reach the “FU” position. It’s pretty entertaining, but I agree it’s not a nice thing to say to one’s employer. Thanks for all the good insight here. I am late-50s and hoping to retire in a couple of years. Oh, I meant to add – I’ve seen those clips. Funny stuff and a great clip. Thanks Mark. I guess I am in this fortunate position now due to a number of reasons. I have always lived well within my means, I think at least partly the result of being raised by two parents who had childhood experience of WWII UK living, with hardships, shortages, rationing etc. That taught me to appreciate what I have and not to waste anything – food, money etc. I retired from the military with a modest DB pension and was lucky enough to get a job right away with an international organization that pays well and will also provide some pension income when I leave. I only started investing two years ago, totally on my own so I have made one really big mistake and a number of smaller ones, but I did get some good pointers from on-line sources and now I have a fairly safe dividend income stream of about $15K per year that will hopefully increase modestly. When I add that to the two pensions it makes sense to quit the current job after I reach my goal within the next two years, since I don’t enjoy going to work anymore. I will still be under 60 so hopefully I will be able to enjoy some of the ER benefits you have outlined, and I don’t rule out part-time or seasonal work to keep busy if necessary, but fortunately for me it will be my own choice. Thanks for your site, and continued good luck. Very interesting background and given your upbringing – not surprised you have done so well. I’ve often found with investing that while we all make mistakes, it’s avoiding the “big ones” that matter. Lessons learned are inevitable. A “fairly safe dividend income stream of about $15K per year” is very good. We’re “there” now with our non-reg. 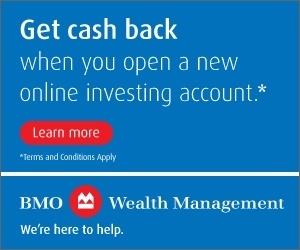 account and TFSAs. I hope we can increase ours modestly over time as well. I certainly wouldn’t rule out part-time or seasonal work to keep yourself busy – active body = active mind. Thanks for the kind words and hope to see you around. As a veteran of FIRE I retired 20 years ago after collecting a portfolio of properties. I actually only worked my Eng. JOB a total of 14 years. My colleagues all ridiculed my decrepit rental properties & the many hours & vacation time we spent rehabbing them. But those same colleagues are still trying to afford retirement or are working menial jobs to supplement what they had saved, passing it off as ‘keeping busy’. Furthermore, as we continue to accumulate properties, we have NOT yet touched the retirement monies we invested to take advantage of ongoing tax deductibility & everything we own is free & clear. Stay focused & frugal as the rewards are exponential. “Stay focused & frugal as the rewards are exponential.” Wise words. Thanks for sharing Pat and best wishes for your successful retirement.